​I was born, raised and educated in England, United Kingdom and left the UK in 2006 when my husband's job took us abroad. We lived in 3 European cities with our 2 West Highland White Terriers before making the long journey from Switzerland to Northern California where we resided for 3.5 years. I have a business background having worked in the field of Human Resources since finishing University where I studied Business and Finance and then went on to complete my Post Graduate Diploma in Human Resource Management. However, from a young age I always had a passion for animals. I loved dogs, cats, birds (I had 5 Parakeets growing up) horses, mammals and never lost my love for them. Then, when we moved to California, my husband encouraged me to take the opportunity to venture into something related to my love for animals. Since I really enjoyed training our 2 West Highland White Terriers I looked into becoming a dog trainer at a well known dog training franchise in California. While employed there, I started out as a dog trainer and became certified to train for the franchise. I worked my way up to head trainer and also had responsibilities for training the other trainers. I ran classes in puppy kindergarten, puppy obedience, dog obedience - basic, intermediate and advanced. I ran workshops - Shy dog, Nosework, Loose leash walking, Recall workshops, Therapy dog, Calm Down workshop and Urban Herding. Additionally I ran 1:1 Private training sessions for owners whose dogs could not participate in group classes either because they were too fearful or were reactive/aggressive which required more specialized training such as behavior adjustment training, systematic desensitization and counter conditioning. While working at the franchise I became a certified AKC Canine Good Citizen Evaluator and ran classes to help prepare owners and dogs to take the test. I continued my education at the Animal Behavioral College and became a Nationally Certified Dog Trainer. This qualification is recognized throughout the USA and Canada. 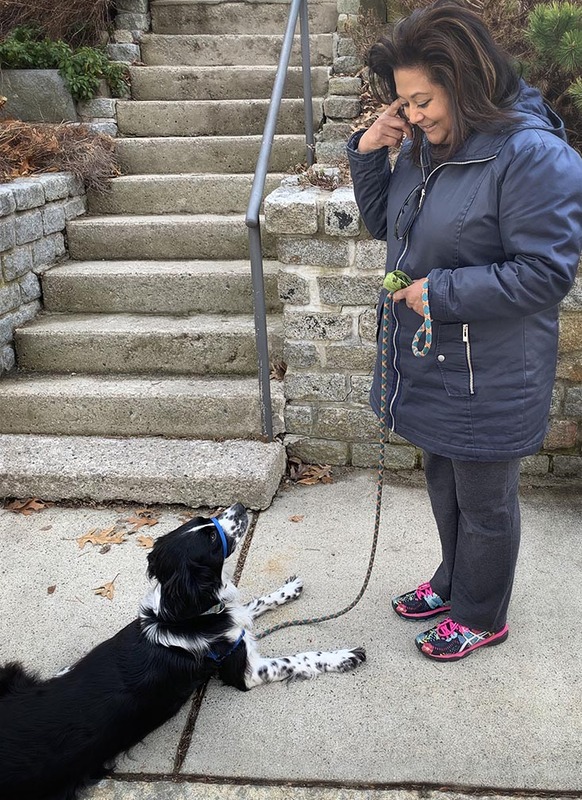 When my husband’s job brought us to Boston, Massachusetts I decided that with all of the experience and knowledge I had acquired, the time was right to branch out and set up my own business as a professional dog trainer.